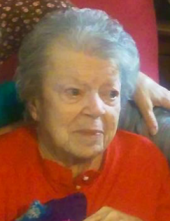 MULCAHY, Berniece Marie - age 97 of Swartz Creek, passed away January 29, 2019. Funeral services will be held 11 AM Saturday February 2 at Sharp Funeral Homes, Miller Road Chapel, our temporary location at Hill Creek Church, 5363 Hill Road, Swartz Creek (Mundy Twp.). Pastor John Hoskins officiating. Burial at Flushing Cemetery. Visitation will be 2-8 PM Friday and 10AM until time of service Saturday at Hill Creek Church. Berniece was born February 26, 1921 in Gladwin, the daughter of Dennis and Ellen (Hudson) Shell. She married Francis Gerald Mulcahy in Flushing on May 3, 1947. Berniece was employed as a Beautician. She was a member of the Flushing VFW Auxillary, the Jolly Mixer Dance Club, and various card clubs. Surviving are: children, Susanne (Ernest) Badder, Mary (James) Clevinger, and Robert (Roger) Mulcahy; grandchildren, Dawn Badder-Wallace, Shawn (Tim) Wheatley, Brian (Erin) Fuson, Dennis (Sarah) Fuson, and Candace (Rick) Wittstock; great grandchildren, Trent, Justin, Destiny, Faith, Jake, Ashton, Eddie, and Alex; great great grandchildren, Hunter, Aubrey, Tobin; sister in law, Marion Mulcahy, Mary Martin; several nieces and nephews. Berniece was preceded in death by, her parents; husband, Francis Gerald Mulcahy; brothers, Kenneth, and Fern Shell; sisters; Irene Myers, and Rhea Hopkins. Tributes may be shared at www.sharpfuneralhomes.com. To send flowers or a remembrance gift to the family of Berniece Marie Mulcahy, please visit our Tribute Store. "Email Address" would like to share the life celebration of Berniece Marie Mulcahy. Click on the "link" to go to share a favorite memory or leave a condolence message for the family.